William Stephenson’s career-long commendation of single-case studies as a critical component of subjective science was accented in his senior years by a series of “self studies.” In the most frequently discussed of these studies, he utilizes Erving Goffman’s The Presentation of Self in Everyday Life as a vehicle for conducting a Q-study of himself upon his formal retirement from the University of Missouri in 1970. In the research reported here, I use the occasion of my own retirement to undertake a slightly modified version of Stephenson’s self-study of my own self, including what Singer and Salovey regard as my self-defining memories of my Goffmanesque “performance” as a professional academic. 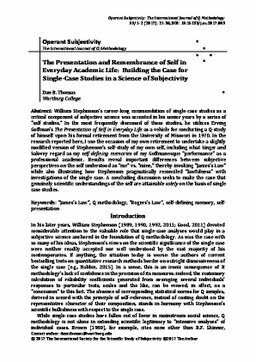 Results reveal important differences between subjective perspectives on the self understood as “me” vs. “mine,” thereby invoking “James’s Law” while also illustrating how Stephenson pragmatically reconciled “lawfulness” with investigations of the single case. A concluding discussion seeks to make the case that genuinely scientific understandings of the self are attainable solely on the basis of single case studies.